Across three continents, citizens are working with their local communities to build more sustainable futures for themselves in housing and energy. New housing in Solapur, India. In Solapur, India, housing cooperatives have come together to build more than 15,000 affordable homes since 2001, relocating thousands of workers from slums. 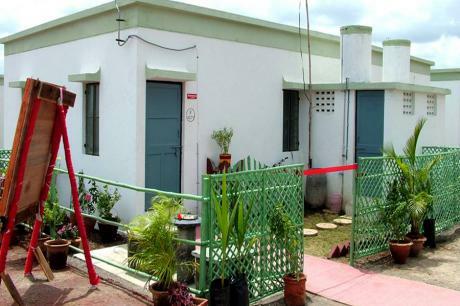 The Solapur Housing Initiative, led by the Centre of Indian Trade Unions, began construction of another 30,000 homes in January 2018, and recently took out the housing category of the Transformative City award. Many of these homes – typically around 50 square metres in size – are for beedi workers, poorly paid cigarette-rolling women who are often the sole breadwinners for their families. These women previously rented tiny shanties in slums. The land purchase cost was shared equally by the worker, the central government and the state government, but the workers struggled for a long time to win their demand and have previous debts cancelled. The award proves that the sheer strength of workers’ sustained efforts, with the cooperation of governments, can deliver results. On the other side of the world, in Bolivia, the residents of San Pedro Magisterio village used to have to fetch water from springs near their polluted river daily. Then the San Pedro Magisterio grassroots community organisation founded a water cooperative. They drilled wells and built the basic infrastructure to bring water to their homes. The funding to solve all these problems came from contributions made by community members, who did all the work themselves. They followed this with a long campaign to build a wastewater treatment plant to clean up the highly polluted river. The community set up a reed bed ecological sewage treatment system serving 4000 people. Resident Doña Magui says they are now trying to replace the reeds with arum lilies because they perform the same function and will help keep the treatment plant going in the long-term, because residents will sell the lilies and put the profits back into maintenance. “As far as the state is concerned, we don’t exist,” Magui says, adding that it was the residents themselves who built the first school, the church and the first roads. This community was awarded the water category of the Transformative City award. The third and final energy category was given to the Spanish city of Cadiz for its action plan against energy poverty. The campaign featured active cooperation between local government leaders and ordinary citizens. A group of unemployed citizens were trained as energy advisers and given an eight-month contract by the city council to tackle unemployment, energy poverty and climate change simultaneously. The team gives families in Cádiz advice on how to optimise their energy contracts so they pay as little as possible. In just three months, the team ran 60 workshops, gave 640 people training on energy issues, and advised 70 families in their homes, reducing their electricity bills by 20-50 per cent. There have been 224 households that have changed their contracts to a time-of-day tariff, another sign of the knowledge gained by workshop participants. While in the South, communities face more severe problems in transforming themselves to achieve sustainability, in the North it is energy poverty which is frequently the hidden but powerful motivator for change. Energy poverty is where building design and energy supply meet. EU energy regulation still lacks a commonly agreed legal definition of energy poverty and this prevents the setting of mandatory targets and roadmaps. In Flanders, Belgium, for example, each household can obtain an annual discount on bills based on its size. In Italy, low-income households and large families are offered discounts on gas and electricity bills, – a national plan supported by all municipalities. In France social tariffs have been replaced by 'energy cheques', which people can use not only to pay their utility bills but also to finance energy-saving works in their homes. In Germany, Berlin’s electricity grid is up for sale approximately every 15 years. When selecting the supplier in 2016, the citizens pushed for fuel poverty to be one of the criteria of buyer selection to be factored in by the local government. In England, Plymouth City Council identified community energy as a potential solution to energy poverty and facilitated the creation of Plymouth Energy Community in 2013, which now includes 1200 individuals and organisations who are transitioning to an affordable and low carbon energy system by offering access to grants to cancel energy debt, free and assisted insulation and advice on the best tariff options. And a Low Carbon Hub Community Energy Fund is tackling the looming end of the British Feed-in Tariff subsidy for locally-generated solar electricity in March 2019, by fundraising frantically to install as many solar panels as possible on schools and businesses before the deadline. It has already successfully installed a new array at a primary school and is working with Oxfordshire County Council to encourage more schools to follow their example. It is campaigning to raise £1 million by 31st of July 2018, to bring in long term equity from positive investors. In Scotland, non-profit social company OurPower, which is owned by social housing providers, community organisations and local authorities, produces and sells its own energy. Profits are reinvested to benefit customers and their community and every member can access locally produced renewable energy at a fair price and is able to control their energy supply and distribution. In Wales, a similar approach is achieved by Awel Aman Tawe, which owns a wind farm and has installed photovoltaic rooves on community buildings. In the Netherlands, a new Climate Agreement was reached at the beginning of this month which includes a community energy target that requires all new wind and solar projects to be at least half owned by the local community. All 33 Dutch regions have regional energy strategies under development. Siward Zomer, representative of ‘Energie Samen’, the Dutch sector association of sustainable energy initiatives of citizens and farmers, said that "We expect a great acceleration of the development of new renewable energy projects where communities can become owners". The control over revenues from renewable energy projects means that citizens, farmers and local entrepreneurs can directly benefit the local community. Zomer says that strong collaboration between the market and the community will accelerate the energy transition. "The transition to a carbon free electricity system needs to be a democratic transition, giving all citizens the opportunity to participate. As part of the overall agreement, five hundred districts off the gas pipeline will have a transition plan within three years, agreed between housing collectives and community groups, local municipalities and other parties." In Mouscron, Belgium (58,000 inhabitants), the first community energy cooperative COOPEM was launched this year by the municipality itself, following a feasibility study and several public meetings, strong involvement of citizens and a partnership with two companies, Energiris (a Brussels citizens’ cooperative) and Aralia (a third-party investor in PV projects). COOPEM’s equity is owned 55 per cent by citizens, 15 per cent by the municipality and 30 per cent by the two private partners. Thanks to bulk purchasing and the government’s Qualiwatt subsidy (a feed-in tariff that runs out at the end of July) citizens benefit from a reduction on the cost of the installation. When residents use energy from the grid, their meter runs normally but when their PV panels generate electricity, the meter runs backwards. Many such organisations are members of the European Federation of Renewable Energy Cooperatives (REScoops), a network of 1,250 European energy cooperatives and their 1.000.000 citizens who are active in the energy transition. Luzy in France is part of another network, the Village in Transition movement. It boasts a farmers’ corner, associative café, the Horizon, the donation shed, all run by citizens, with municipality support. Luzy is a member of POTEs (Ordinary Energy Transition Pioneers), fostered by pan-European initiative Energy Cities, whose Carine Dartiguepeyrou says "are every-day-life innovators and visionaries working in areas related to the energy transition that Energy Cities, the Bourgogne Franche-Comté Region and ADEME, the French national energy conservation and environment agency, are forming into a network. "POTEs are efficient and innovative… they collaborate and take care of others by helping them make progress in their project and overcome difficulties." She explains that "A good example of this is the 'hold-up' method, a collective intelligence tool used for the third place the Horizon and the farmers’ corner at Luzy. Starting with an issue faced by each project, the participants put forward solutions to help the Horizon find a new business model and the farmers’ corner perpetuate its activity. "In order to solve concrete challenges faced by project leaders (social entrepreneurs, researchers, engineers, government, NGOs ...), the actors who participate in a Hold-Up discuss and exchange ideas." The European Council and the European Committee of the Regions (CoR) are drafting models of local energy ownership and the role of local energy communities in energy transition in Europe. Energy Cities has prepared a joint contribution together with ResCoop.EU, the European federation for renewable energy cooperatives for the European Parliament to move forward on this issue. They are arguing that "only by distributing control among local actors will we be able to get to a fair energy transition and effectively fight climate change. Furthermore, this would contribute to local development and the reduction of (energy) poverty." They perceive an enormous interest among local authorities to take control of the energy infrastructure, but also a lot of uncertainty on the 'hows and whats', and fear of failure. For REScoop.eu, renewable energy cooperatives are ideal partners to lead the energy transition to energy democracy. Sharing best practices and organising exchanges between cities can fill in the current knowledge and confidence gap. So the EU Energy Poverty Observatory has published a new Guidance on designing effective energy poverty policies in municipalities about how to implement realistic and appropriate local energy poverty policies. The EU Energy Poverty Observatory is now inviting municipalities to apply for technical assistance with the implementation of this guidance, including insights from best practices and recommendations based on the local circumstances.